From as little as 90p per envelope. The digital age of document signing is here! TaxCalc eSign Centre dramatically reduces the time spent obtaining client approval for tax returns, VAT returns and sets of accounts. Simply send over an electronic copy of the document, ask the client to check and sign – you’ll be notified immediately and you can submit the document straightaway. Using our tried and trusted SimpleStep workflow, preparing documents for electronic sign-off couldn’t be easier. Clients can sign on any device - smartphone, tablet, laptop and desktop – from anywhere at any time. You pay by envelope – and can buy envelopes in blocks. The more envelopes you buy, the more inexpensive it becomes. *eSign Centre requires Tax Return Production, Accounts Production or VAT Filer. The introduction of eSign Centre couldn’t be better timed. eSign Centre is brought to you as Individual Tax Return preparation ramps up in January and in time for the December Accounts Filing deadline. We aim to make our software as easy to use as possible but for those times when you need us, you can be sure we're there. Our support is unlimited and provided at no extra charge. 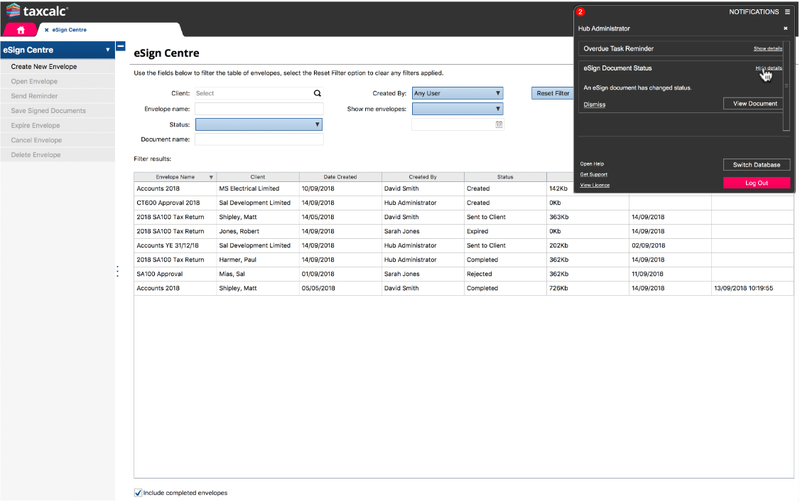 eSign Centre workflows are the same as the ones you know and love so well in TaxCalc. SimpleStep acts as your personal assistant, making sure you follow the correct process to have all the information in your envelope. Our intelligent validation tool Check & Finish highlights any errors. Making the whole process efficient and providing peace of mind. As you expect from TaxCalc, we’ve made it easy to perform the workaday tasks quickly. 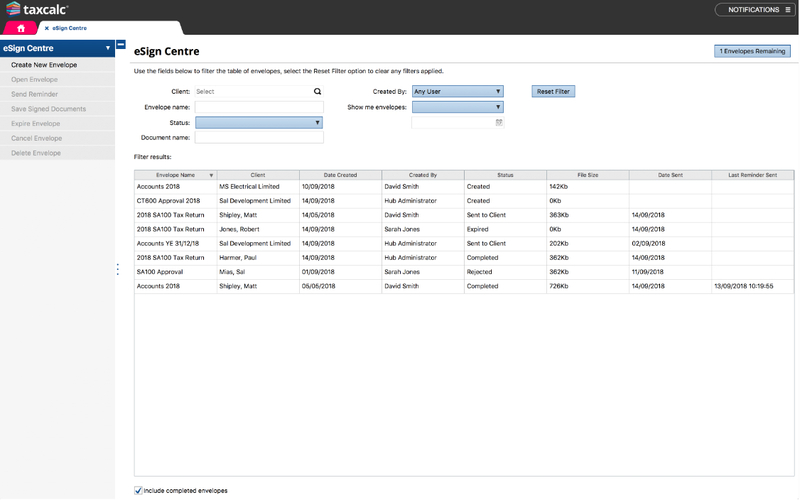 eSign Centre will create a recipient list based on client data held in Client Hub. It will also allow you to generate or add a set of Accounts, Tax Return or VAT Return to a new or existing envelope directly from Accounts Production, Tax Return Production or VAT Filer. eSign’s Control Centre does exactly what it says and keeps you in control, providing an overview of all your eSigning activities and their status. You can see all envelopes you’ve sent – and to whom. You can set automatic reminders for your clients (if you need to nudge them for their signature!). Multiple signers. Multiple documents. One envelope. Often you need more than one signature on a document. The process is straightforward in eSign Centre. Set who signs in a chain order and watch the document go from one signer to the next. Or if you need signatures for sets of Accounts, Tax Returns or VAT Returns, you can simply send them in the same envelope and reduce your costs! 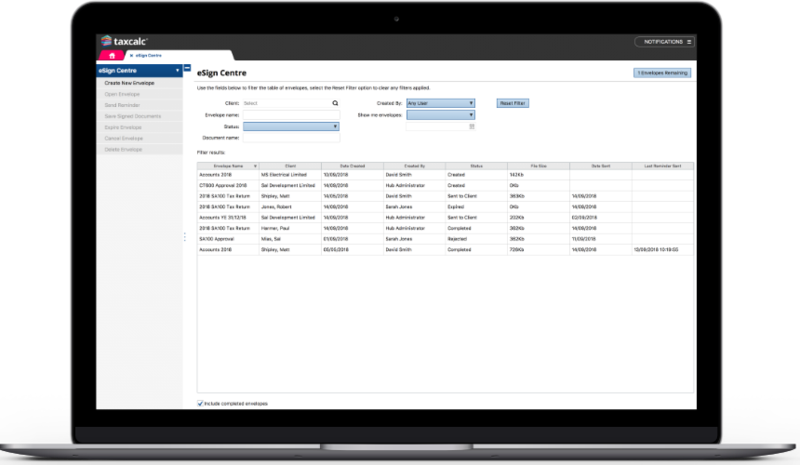 We've teamed up with leading electronic document signing provider Signable to bring you the TaxCalc eSign Centre. Signable uses cutting-edge technology to provide a secure online, digital process for signing documents. This allows us to capture electronic signatures on a TaxCalc generated document, quickly, efficiently and with peace of mind. eSign Centre allows you to easily send documents from TaxCalc to your clients for approval. Manage documents that need signing and keep track of progress. 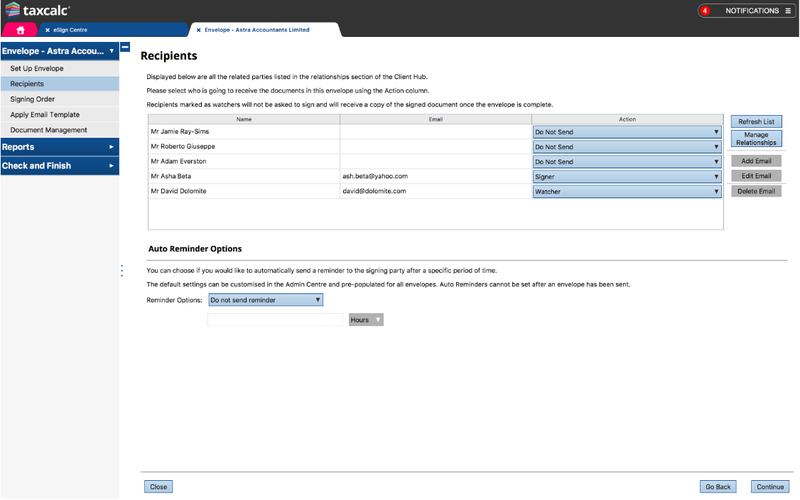 Easily create envelopes, add recipients and choose a signing order. 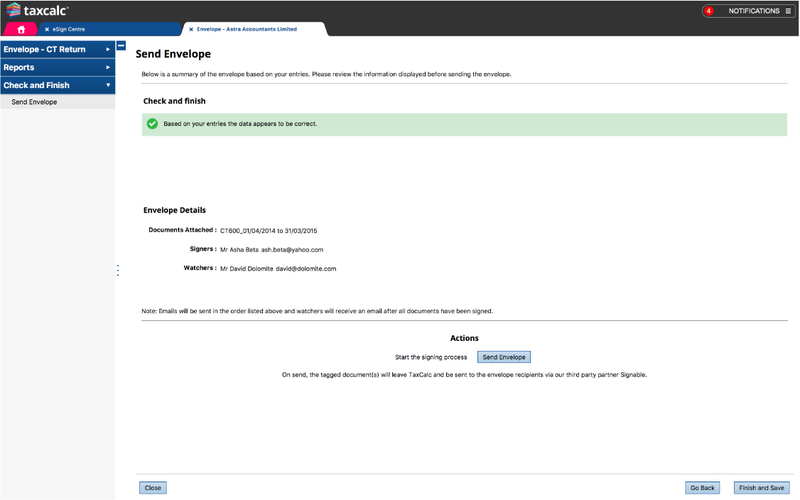 Add recipients directly from your Client Hub and manage how they are notified or if they are required to sign the document. Select where clients need to provide a signature, in multiple locations if needed. TaxCalc's Check and Finish will check your envelopes for errors before you send them to your clients. When a client responds, or signs a document you'll know right away via TaxCalc's notification centre. Can I take a Trial of eSign Centre? Yes. We provide one eSign envelope to try out for FREE, if you’re an existing customer or taking a trial. Once this has been used, envelopes can still be created but you will need to buy additional envelopes to send them to your clients. How long do eSign envelopes last? Once you have purchased your eSign envelopes they will remain on your account until they are used. Can I buy more envelopes before I’ve used up my existing envelopes? Yes. eSign envelopes are pay as you go, so if you are running low, you can choose from one of our envelope bundles to top up at any time. Can I change the email settings to be able to send the documents from my own email account? No. 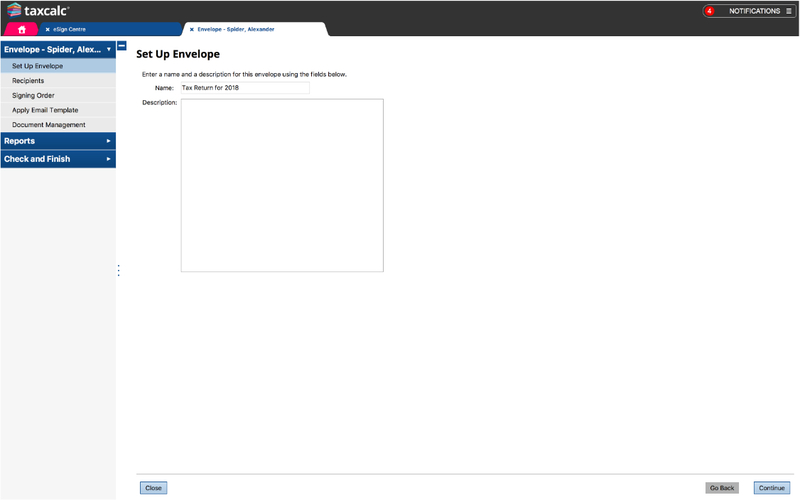 Unfortunately it is not possible at the moment to customise the email configuration. The email sent to your client will be generated by our partner Signable. Can I send more than one document within an eSign envelope? Yes. An eSign envelope created for a client will allow multiple documents to be included at the same time. 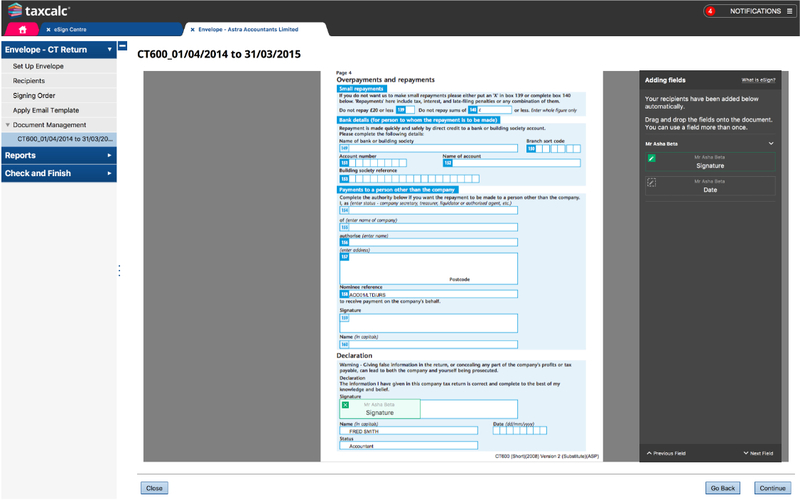 Can I use eSign Centre to send other externally generated documents to my clients? No. eSign Centre is not a document exchange portal and only allows electronic signing of documents generated from within TaxCalc (currently sets of accounts, tax returns and VAT returns). Please select from the options below to build your TaxCalc eSign order.